This pay-to-play wasteful spending has got to stop. So does this crap. “I don’t like to look backwards. I’m a guy who looks forward and solves problems,” Pscholka said. What a pompous, can-kicking schmuck, but, there it is as plain as day. 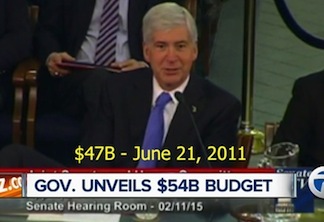 Rick Snyder’s playbook line used to justify his actions as a big spending, everyone connected gets a kickback Republican. You folks tired of hearing it yet? Guess not. Methinks, there’s a growing consensus they all should just be thankful there is a disinterested, ill-informed, and apathetic electorate otherwise all the Oath sworn f****** would be hearing footsteps in their sleep. SB 509 and SB 1149. Ps. thanks for the empty words, Colbeck you fraud.